Heather Dewey-Hagborg’s Radical Love is an homage and exploration of gender identity stereotypes in forensic DNA phenotyping. The full color life-sized 3d printed portraits of Chelsea Manning were generated from analyses of her DNA, extracted from cheek swabs and hair clippings sent to the artist from Chelsea through the mail. When used by the police to generate a suspect’s likeness, DNA phenotyping dramatizes gendered and racial stereotypes, all the while highlighting the degree to which such projections remain subjectively constructed. Dewey-Hagborg instead offers two facial portraits—corresponding to both female and neutral genders. Jonas Weber Herrera’s video Torso as Principle, is a video of found footage from YouTube related to the artist’s PhD research on Body Integrity Identity Disorder, or Transability. Here, he interrogates the syndrome as signifier for completeness as a relation of subject to mediated representation. With YouTube as a platform, the found videos also become instructional for other viewers. 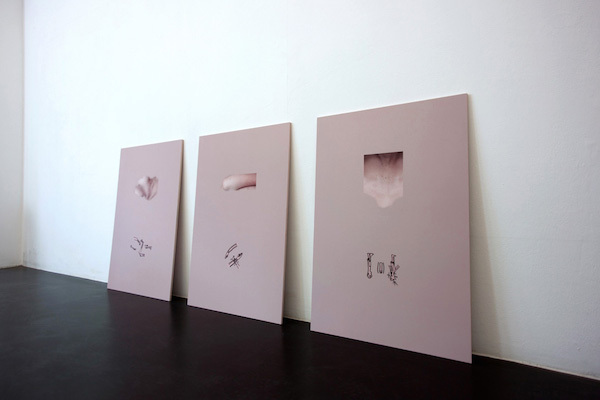 Likewise, his three prints, Untitled (Manifest) isolate specific diagrams of gestures from Beatriz Preciado’s 1990 Manifesto contrasexual below the decontextualized body part that accomplished the corresponding movement. Weber Herrera’s research traces different historical meanings and discourses on bodies and embodiments, to produce counter narratives based on body representations whose processes of identification work through difference rather than similarity. Kato Six’s sculptural works and interventions upon the walls of the gallery operate in a space akin to what Duchamp called the infrathin: they subtly refer to the categories of materiality and immateriality, interiority and exteriority, referentiality and autonomy, only to disturb such binaries. Oscillating between images and sculptures, while placing the two on the same plane, Six’s works privilege sight as the first form of experience. Words fall away. Andreas Savva’s complex in-situ installations describe networked systems, held in tension through taught string, which functions as a connecting media. These systems house everyday objects that defy gravity, levitating in the web of his assemblages and arrested in their location as if time had stopped and a dense field had grown around them. this way, they are both protected and held captive. At Peninsula, Savva’s structure holds wooden sticks in a delicate balance, wherein the connecting string constitutes an integral structural component. Heather Dewey-Hagborg has shown work internationally at events and venues including the World Economic Forum, Shenzhen Urbanism and Architecture Biennale, the New Museum, and PS1 MOMA. Her work has been widely discussed in the media, from the New York Times and the BBC to TED and Wired. She is an Assistant Professor of Art and Technology Studies at the School of the Art Institute of Chicago and a 2016 Creative Capital award grantee in the area of Emerging Fields. Jonas Weber Herrera is a filmmaker, artist, writer and university lecturer in Berlin. His work focuses on the construction, shaping and conditioning of bodies through power structures as well as sociocultural and media effects. His works have been shown internationally in film festivals (KunstFilmBiennale, Cologne. Kasseler Dokumentar- and Videofest) and exhibitions at KW Institute for Contemporary Art, Akademie der Künste, Autocenter, Berlin, Kunstverein seit 1817, Hamburg, Centre George Pompidou, Paris or Museo Reina Sofia, Madrid. He is a grant recipient of the Graduiertenstiftung des Freistaates Thüringen, the Senate of Berlin and has also been supported by the International Research Institute for Cultural Technologies and Media Philosophy, Weimar mentored by Harun Farocki. Weber Herrera has also published articles for the weekly newspaper der Freitagandand waahr.de. and was co-editor of the volume z.B. – Praxisbasierte Forschung in Design und Kunst. Andrea Savva (born 1970, Cyprus) studied painting at the Athens School of Fine Arts (1991-1996) and completed his MA studies in “Digital Forms of Art” at ASFA (2002-2004). He has presented his work in several solo exhibitions in Greece (Athens, Thessaloniki), Cyprus (Nicosia), Ireland (Cork) and Germany (Munich) and in many group exhibitions in Greece, Cyprus, France, Spain, Germany, Italy, Portugal etc, including: European Young Artists Biennial, Rome, 1999 (cur: Yiannis Kounelis), Europe Exists, 2003 (cur: Rosa Martinez & Harald Szeeman), Seville Biennale, 2004 (cur: Harald Szeeman), Instant Europe, Italy 2004 (cur: Francesco Bonami), Action Field Codra, Thessaloniki 2008 (cur: Ruth Noack), Open 12, Venice Lido 2009 (cur: Paolo De Grandis). One of his most recent installations can be seen at the Fields Sculpture Park, OMI International Art Center, Ghent, NY (cur: Nicole Hayes). He lives in Nicosia, Cyprus.Belgian artist Kato Six (born 1986) aims to reconfigure our experience of the ways we make ourselves at home in the world. She uses elements, forms and materials that recall former interior designs as a starting point for her installations. She studied graphic design and multimedia design at the School of Arts in Ghent. Recent exhibitions include: Background Hum, c-o-m-p-o-s-i-t-e, Brussels, Focus moves aside, objects appear, WIELS, Brussels, Vibrant Matter, KIOSK, Ghent and Hijacking Karma, Oude Kerk, Amsterdam.Image: Jonas Weber Herrera, Untitled (Manifest), 2016, Inkjet prints, 23.6 x 15.75 inches each. Courtesy of the artist. For more information on Residency Unlimited click here. Image: Jonas Weber Herrera, Untitled (Manifest), 2016, Inkjet prints, 23.6 x 15.75 inches each. Courtesy of the artist.